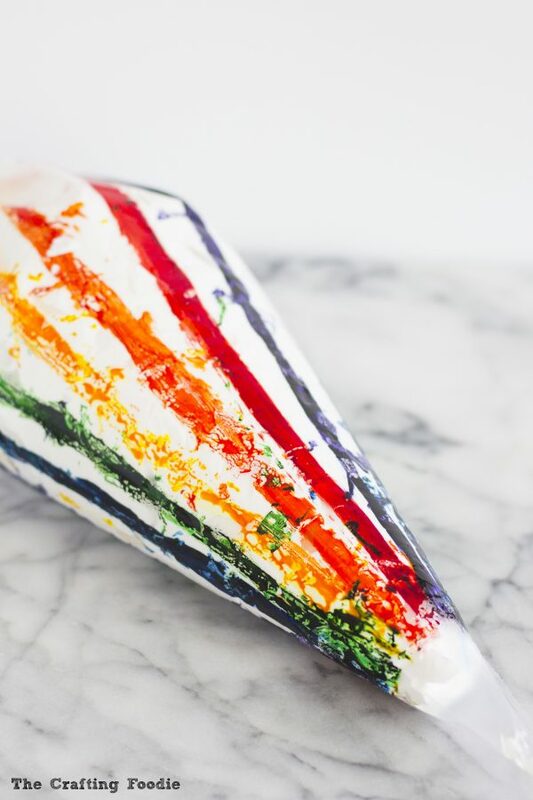 These Rainbow Meringues are light and airy with a crisp exterior and a soft, moist, marshmallow-like interior. 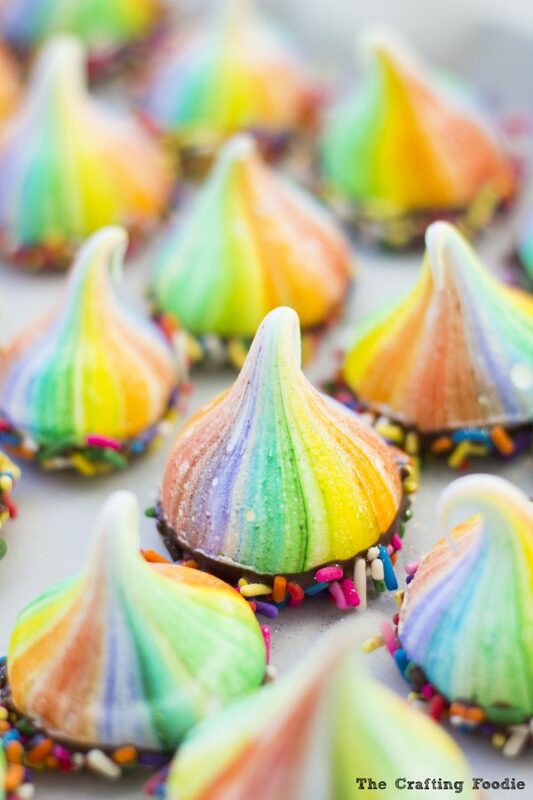 To make these Rainbow Meringues even more special, they’re dipped in chocolate and sprinkles and topped with some edible glitter. I think I need to buy some chickens and have a little coop in my backyard. Yeah, my husband would never agree to that, but a girl can dream 🙂 I’m obsessed with egg-white based desserts (homemade marshmallows, swiss meringue buttercream, and macarons just to name a few). That leaves me with tons of yolks (which, by the way are perfect for making madeleines – good thing my picky kids love madeleines). So my latest egg-white obsession involves meringues. And The Meringue Girls have fueled my fixation. They run a bakeshop in London, and if you’re ever feeling blue, take a peak at their Instagram account. Not only are there rainbows and fluffy, cloud-like meringue everywhere, but The Meringue Girls are sharp, funny, and totally rocking feminists. They’re my kinda peeps. Since I wasn’t about to produce a crate of 170 meringues in rainbow hues (which is the Meringue Girls’ signature creation), I decided to pack the entire rainbow in one little meringue. I think when people see so many colors jammed into one little treat, they can’t help but wonder how it was done. It’s not very complicated. Actually, it’s not complicated at all. 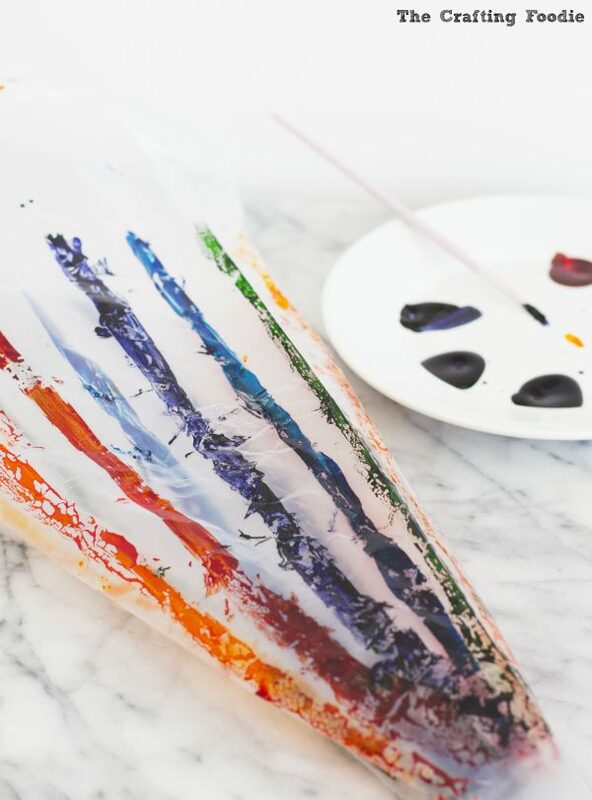 All you need is a piping bag, some gel food color, and a food-only paintbrush. 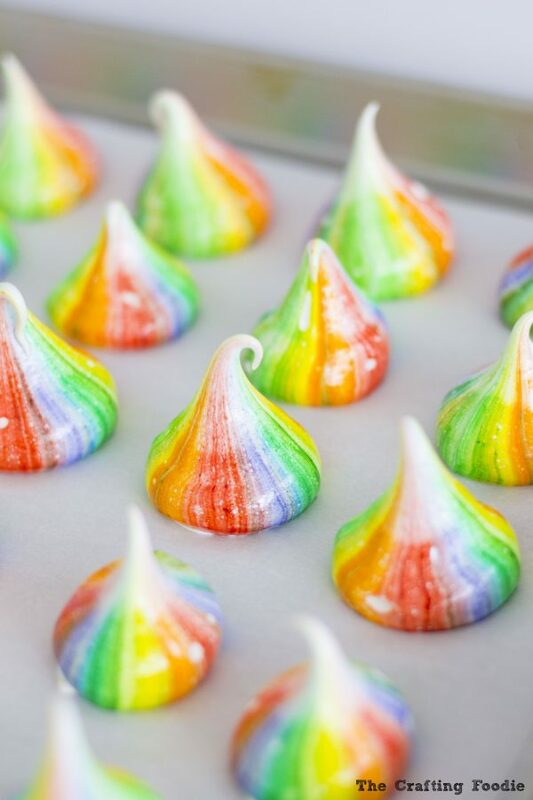 And voila – rainbow meringues. I took a large 18-inch plastic piping bag, and turned it inside out. I placed the piping bag over a bottle (I used an olive oil bottle but any large bottle would work) so that it was stand upright and stiff. Then I took gel food color (all AmeriColor brand gel food color in Red Red, Orange, Lemon Yellow, Forest Green, Royal Blue, and Violet) and squirted a little dollop of each color on a plate. 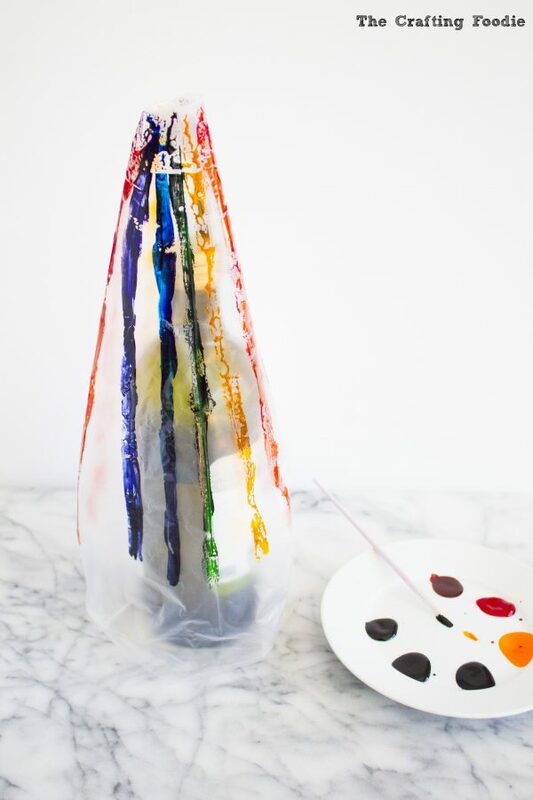 Using a clean, food-only paint brush, I painted stripes of each color along the bag. Since my bag was so large, I made two stripes of each color. Then, as carefully as I could, I pulled the piping bag right-side in so that the food color was on the inside of the bag. Next, I used a large spatula to spoon in the fluffy meringue. Then I snipped a large opening in the piping bag. And piped away. After the meringues cooled completely, I dipped them in chocolate and sprinkles. And then my favorite part: sprinkling them with edible glitter. The only flavoring I used for the meringues was some vanilla. But I’m ready to make my next batch with some dehydrated raspberries or blueberries to give them a natural color and flavor. 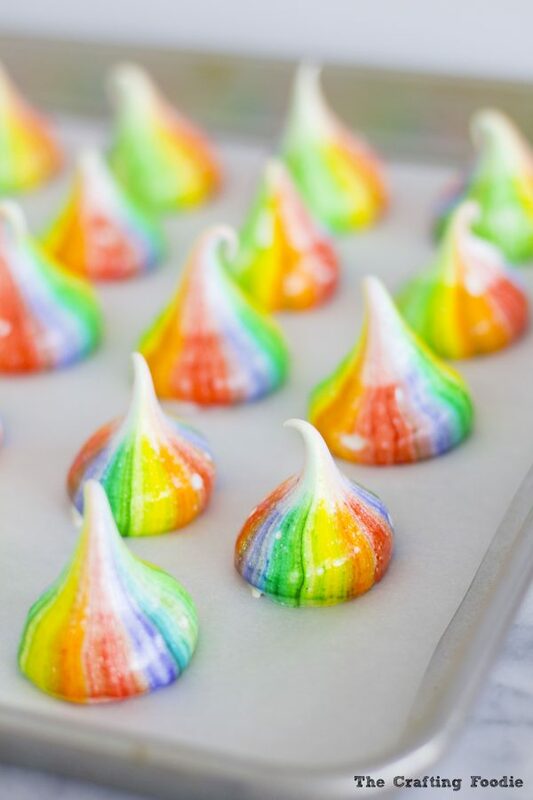 These Rainbow Meringues are light and airy with a crisp exterior and a soft, moist, marshmallow-like interior. 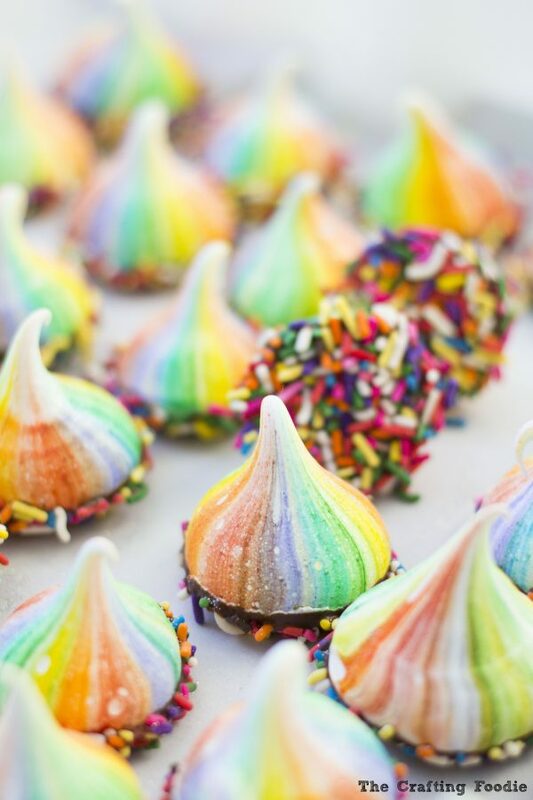 To make these Rainbow Meringues even more special, they're dipped in chocolate and sprinkles and topped with some edible glitter. Prepare the metal work bowl of your stand mixer by making sure it's grease-free. (I do this by wiping down the inside of my bowl with lemon juice). Make superfine sugar by placing sugar in the work bowl of a food processor fitted with a metal blade. Pulse until sugar is a fine dust. Measure 300g of the superfine sugar and place on a parchment lined baking sheet. Bake sugar for about 5 minutes or until the edges of the sugar begin to melt. Meanwhile, pour your eggs in the bowl of a stand mixer fitted with the whisk attachment. Whisk on low until bubbles form. 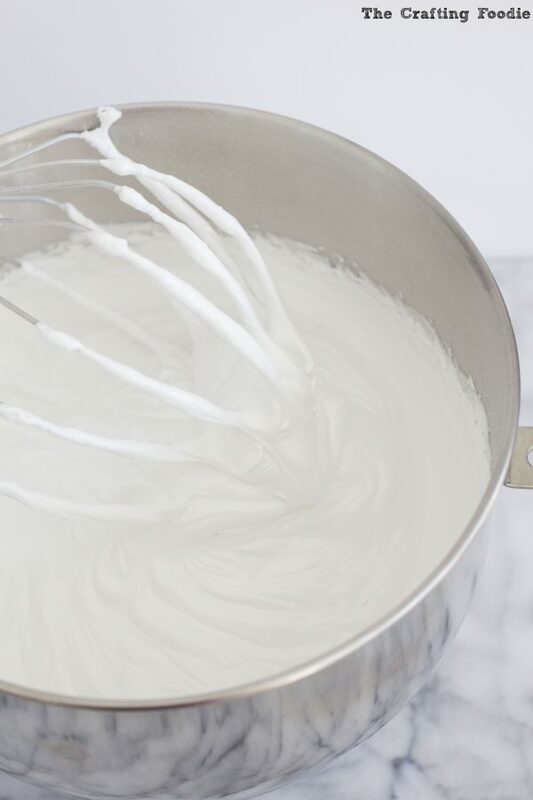 Once bubbly, turn the mixer to high and whisk until stiff peaks form. You now your egg whites are ready when you can turn the bowl upside down without the eggs falling out. Remove the sugar from the oven. While the mixer is on high speed, add large spoonfuls at a time. Making sure egg whites come back to stiff peaks after each addition. Once all the sugar is added, continue to whisk for about 7 minutes. You should be able to rub the mixture between your fingers and not feel any grit from the sugar. You know it's ready to use when it forms a smooth, shiny peak. Decrease the oven temperature to 200 F.
See blog post on how to color meringues. Bake meringues for about 30-40 minutes or until they can be easily lifted off of the parchment paper with their bases in tact. Dip in melted chocolate and sprinkles. These are absolutely beautiful! Im doing a unicorn party and these will be perfect! Thanks for the recipe! Pinning now! These look amazing! I always love a happy rainbow, such a fun little treat! these look amazing!! Great job! These are so cute. What a neat idea for meringues. They are so creative and colorful! Oh I love this! 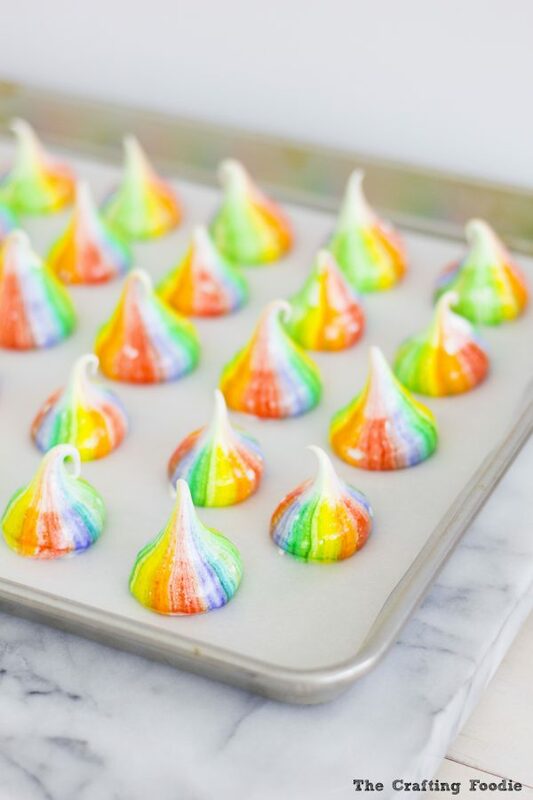 Those rainbow meringues are so cute — I definitely want to try making these. I love how they turned out! I am going to have to check out that Instagram account now ha ha. These are amazing! What a beautiful sweet treat! I would love to try to make these! These are so beautiful! I can’t believe how perfectly they turned out! These would be wonderful for Easter or any spring or festive occasion! These are so pretty! I have no idea how you made them so neat, they don’t even look real!